Bowen Designs' fantastic output of Marvel Statues shows no sign of letting up. 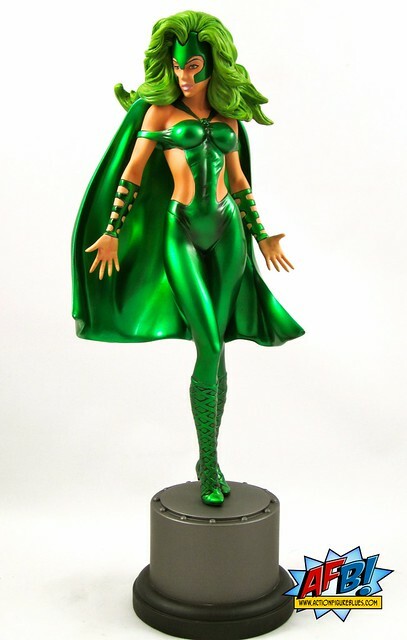 After delivering a fairly comprehensive range of Classic X-men in mini-bust form, Bowen has turned their attention to delivering Full Size Statues of characters like tonight's offering: the Bowen Designs Polaris Full Size Statue. Most of my collecting is about team or universe building, and while Polaris probably falls into the category of a character that I “need” for the purpose of completing a character group as opposed to a character that I want, there are a number of aspects about this piece that make it a very welcome addition to my statue collection as a piece in its own right. Sculptor Mike Cusanelli has been working on a number of Bowen females lately, and this is another of his efforts. While his posing generally leaves me cold due to the lack of energy and power in the forms he creates, the detail on this statue is very nice to look at. The laces on her boots and natural creases in her body suit are very nicely done and show that Cusanelli definitely has skill. The colour choices made for the greens on this statue are stunning. I always enjoy the judicious use of metallic paint on statues, and it has been used to great effect here. I love the effect - which is very nicely contrasted by the lighter green matte paint used for Polaris’ hair. The Internet is a brilliant tool for stirring up worry over nothing, and this piece was the subject of some panic postings about the angle the statue stands at. To me it seems this is an issue of how the statue is inserted into the base. While it is built on a taller and thinner base than many recent offerings, I took a moment to make sure I was placing Polaris at the correct place on the base, and the end result is that mine doesn't lean awkwardly at all. The issue I'd raise with this piece is pretty minor. 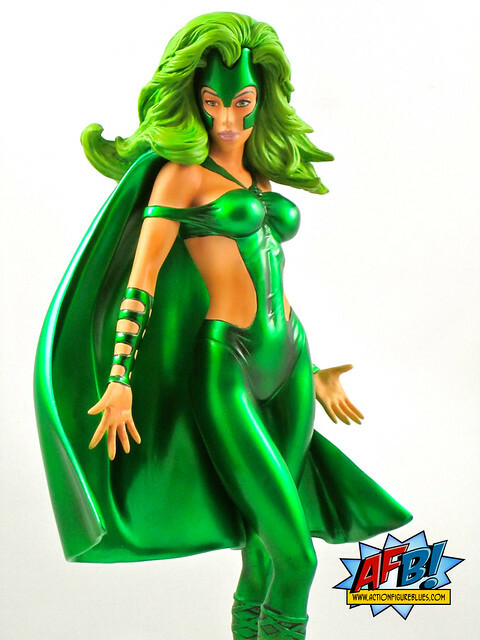 It’s the color of Polaris' lips - the choice made was pink, as opposed to the green lipstick she's often depicted with, and the result is that it makes her face a tad washed out amongst the brightness of her hair and costume. While this statue is unlikely to come up in any “best of” lists at the end of the year, it’s a more than serviceable effort which does more than just fill the gap of a much-wanted character. The great green metallic work and the slightly elevated height are both nice touches that give this a couple of steps above the average. You can see more pics at Facebook, discuss this at the AFB Forum, and comment on this post to enter the April AFB Comment of the Month Contest! This character has never looked sexier. i like the boots. great detail.